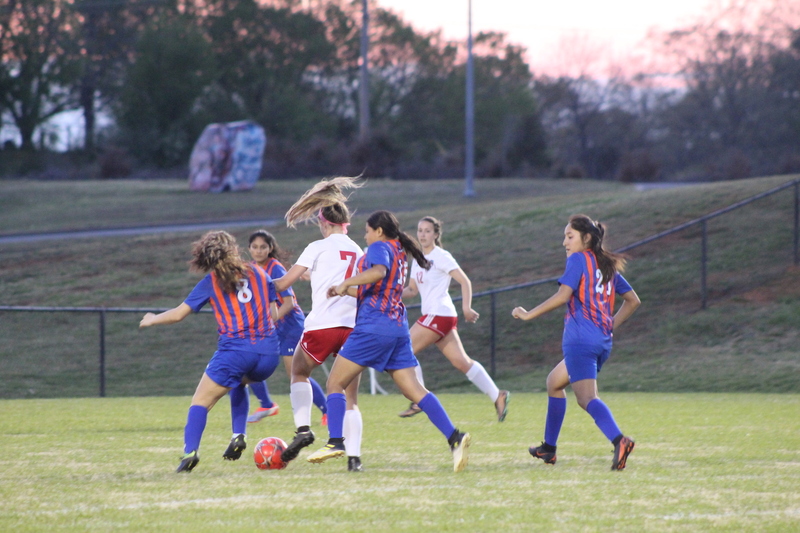 Sophomore Zoe Kennedy maneuvers through the Richland Northeast defensive line for a shot on goal. Spring is coming up after this long winter and there are many sports who are ready to get started again. There are a total of eight spring sports here at South Pointe High School. Varsity softball last year had an overall record of 10-2 with a victory over cross-town rivals both Northwestern and Rock Hill. Varsity baseball has started with some conditioning and practice over the winter and they hope to keep up their winning streak. Girls soccer had a region record of eight wins and two losses. With a winning record of 9-2, boys soccer has acquired a new coach this year. Boys tennis last year finished second in the region and hope to achieve first place this year. Track had an amazing season last year as girls 4×1 and 4×4 team made it to state while boys worked hard for their successful season. Spring sports for this 2019 season is going to be one not to miss. Many seniors and juniors fill up these spring teams and help to encourage many sophomores and freshman to learn how to become leaders for their teams.